The Litany of St. Joan of Arc Lord, have mercy on us! Jesus Christ, have mercy on us! Lord, have mercy on us! Jesus Christ, hear us! Jesus Christ, graciously hear us! Our Heavenly Father, Who art God, have mercy on us! Holy Trinity, Who art God, have mercy on us! Holy Mary, virgin Mother of God, pray for us. 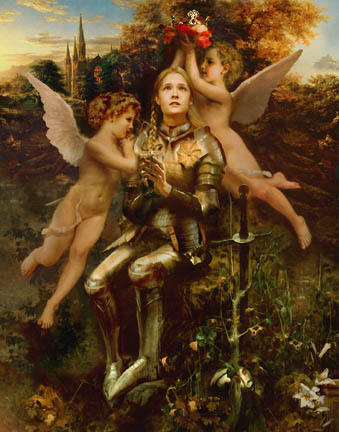 Saint Joan of Arc, confidant and submissive to her voices, pray for us. Saint Joan of Arc, Martyr of Rouen, pray for us. Saint Joan or Arc and Saint Therese of Lisieux patronesses of France, pray for us. All the Saints of France, intercede for us. Lamb of God, Who takest away the sins of the world, ave mercy on us, Lord. Lamb of God, Who takest away the sins of the world, graciously hear us, Lord. Lamb of God, Who takest away the sins of the world, have mercy on us, Lord.